Following on from my visit to Riverford a couple of weeks ago, I am very pleased to offer up a giveaway and no, it’s not a veg box. Riverford sell more than just vegetables: they sell chocolate both on their online and in their bricks and mortar shops, Montezuma’s organic chocolate to be precise. You can follow Riverford on Facebook and Twitter. Riverford are offering up an exclusive prize for Chocolate Log Blog readers. Sadly, even I didn’t get to sample this one – it’s just for one lucky winner. Luckily, CT bought me a copy of the book a couple of years ago, so I don’t feel too short changed. As you would expect from an organic vegetable farm, this is a recipe book all about vegetables. Written by Guy Watson and Jane Baxter, former head chef at the Riverford Field Kitchen, it celebrates British food and focuses on the fruit and vegetables that can be grown here in the UK. The chapters come in an A-Z format of fruit or vegetable, starting with apples and ending with turnips. As well as recipes, each chapter has some information on each crop including varieties, storage and preparation. This makes it super easy to find a recipe for that last celeriac lurking in the fridge or the bag of quinces a kindly neighbour presented to you and you haven’t a clue what to do with. Spiced celeriac with lemon is delicious, I know because I’ve made it. I adore membrillo, the famous Spanish quince cheese, but have not yet made my own. When I do, I’ll know where to go for the recipe. The accompanying chocolate can be put to good use, as there are some recipes in the book using this most wondrous of ingredients. To my shame I haven’t yet made the Riverford Farm version of beetroot brownies, but I have made their Chocolate Courgette Cake which turned out really well despite me forgetting to add some of the sugar. 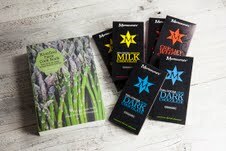 Riverford have kindly offered an exclusive prize of a Riverford Farm Cook Book and six 100g bars of Montezuma’s organic chocolate as a giveaway on Chocolate Log Blog. To be in with a chance of winning this, please fill in the Rafflecopter below. You will need to leave a comment on this post which then gives you additional chances to enter if you so wish. Rafflecopter will pick a winner at random from the entries received. Please give me some way of identifying you in the comment section as I will be verifying the validity of entries and will always check back to the comments to ensure that part has been done. Any automated entries will be disqualified. This giveaway is only open to those with a UK postal address. You need to be 18 or over to enter. Winners will need to respond within 7 days of being contacted. Failure to do this may result in another winner being picked. Prizes are offered and provided by Riverford and Chocolate Log Blog accepts no responsibility for the acts or defaults of said third party. cheesy potato and sprout bake. Very much like a cheesy potato bake but with a layer of mashed sprouts in the centre and topped with mozzerella. Ooh, tough question, but probably a soup. You can get such amazing, creamy textures from veggies like butternut squash & sweet potatoes. I make a great Baby Lima Bean Souffle! All my family love it so this would be my specialty dish! smoked butternut squash and feta salad with rocket and fennel – simple but oh so tasty! a colourful Mexican dish like a Confetti Rice Wrap or a Three Bean Burrito with the salsa etc. on the side. wild parasol mushrooms cooked with freshly picked wild garlic & shallots. spicy okra in tomato sauce with rice. A nice Greek spanakopita or spinach pie. Mediterranean root veg, roasted with garlic and olive oil and served in a three cheese sauce. A veggie & chickpea stuffed roasted sweet potato! Some of my favorite foods all on one plate. Leek and pasta bake – comfort food! Good old fashioned bubble and squeak! Tumbet – a Mallorcan vegetable stew. I would make brie & mushroom stuffed peppers yum! Pea and cabbage risotto balls! I’d do courgette pasta with a homemade pesto! Macaroni cheese with stuffed mushroom peppers. A mushroom risotto with red and green peppers! A Sugar Snap Pea & rocket salad. It would be a spicy soup which I would change according to locally grown seasonal vegetables. Probably a soup, so much you can do with a soup! Would have to be a nice warming winter soup. Oh dear, I would never be a head chef anywhere. Something with roasted aubergine would be good, all squidgy and lovely. I think cauliflower cheese. Easy, I know. But I’m not the best cook. Doubt I’d EVER be a top chef! Butternut Squash, Potato and Mushroom Bake. I often make this. It’s very easy to make and very tasty too! Aubergine Parmesan or a potato and leek dauphinois..yum! Cauliflower cheese with cheddar and blue cheese – yum! Mmmm corgette cake sounds so nice – why stop at just carrot?! Top dish would be sweet potato wedges with coleslaw and falafel burger! I make a mean carrot and coriander soup! Cheesy leek, potato, carrot and pea pie with a puff pastry top. Gorgeous! Asparagus Spears (killer – geddit) ! Potato Dauphinoise classic I know but I love it!!!! It has to be celariac gratin, i’ve only recently tried it and it’s great. Aubergine and courgette bake, topped with goats cheese… yummy. Alternate layers of mozzarella,tomato and aubergine cut in circular slices and oven baked in a cheesy sauce. Yum! I would make a spicy vegetable stir fry with thread noodles.I would use only fresh seasonal vegetables so the taste and texture would vary each month. Cous cous with roasted vegetables and feta. I make a lovely tomato and butternut squash risotto. Thai vegetable curry with noddles would be my perfect dish! Vegetable lasagne with courgettes, carrots, mushrooms, tomatoes and thick cheesy sauce.